How will Crossrail 2 reshape connectivity and development relationships? The National Infrastructure Commission’s recent recommendation that Crossrail 2 be taken forward received Government endorsement in the 2016 Budget Statement. The strategic case for Crossrail 2 has inevitably been linked to housing growth, with improvements in connectivity along the length of the route reportedly having the potential to unlock 200,000 new homes. The link between improved connectivity and housing growth raises an important question going forward: will the need to maximise growth opportunities around Crossrail 2 benefit how connectivity and development density relationships are assessed in future? By 2030 London’s population will exceed 10 million people, making it a true megacity and placing unprecedented demand on transport infrastructure in the capital and the south east. Even with the essential investment already being made in Crossrail’s Elizabeth Line and upgrades to the Underground network, more transport investment is needed. “Transport for a World City”, the National Infrastructure Commission’s March 2016 report reviewed the strategic case for additional large scale transport infrastructure in London, and concluded that Crossrail 2 is a fundamental requirement to address the transport challenges that will face the capital from 2030 onwards. The National Infrastructure Commission views Crossrail 2 as an investment of national significance, and called for funding to be made available now to progress scheme development. This stimulus is crucial if a hybrid bill is to be introduced by late 2019, and if Crossrail 2 services are to be operational by 2033. The Treasury has now committed £80M to developing Crossrail 2, and expects Transport for London to match this funding. The current TfL cost estimate for delivering Crossrail 2 is £32.6bn. The Commission also reinforced the need for continued investment in other transport schemes in London, including the river crossing and Underground extension schemes currently being investigated. Crossrail 2 is a proposed new railway for London that would link National Rail networks in Surrey and Hertfordshire via tunnels between Wimbledon, Tottenham Hale and New Southgate. Crossrail 2 will relieve congestion on existing Underground and National Rail routes. It would allow passengers to bypass congested London stations such as Waterloo and Liverpool Street, and provide interchange connections with London Underground, London Overground, Crossrail Elizabeth Line, National Rail and International Rail services. As well as directly benefiting London, Crossrail 2 will support wider economic regeneration in the south east by releasing capacity on the regional rail network, cutting rail journey times, and supporting the provision of new homes and jobs. Crossrail 2 must stimulate significant housing growth within and around London. This is a key aspect of the strategic case for Crossrail 2. Not only is it seen as vital in meeting housing demand for the capital and the south east, revenue raised from development would also form a significant part of the potential funding package for Crossrail 2. The National Infrastructure Commission reported that Crossrail 2 has the potential to unlock 200,000 additional new homes by improving connectivity along the length of the route. Some 75,000 of these additional new homes could be outside Greater London in Surrey and Hertfordshire. The Commission evidences a number of studies to highlight the growth benefits that Crossrail 2 may unlock. It cites increased rates of residential development on the Jubilee Line Extension, and investment decisions and increased residential value on the route of Crossrail’s Elizabeth Line as examples of the positive benefits that should accrue within the Crossrail 2 zone of influence. Crossrail 2 is also likely to promote growth on other transport corridors. South West Main Line services will benefit from the congestion relief offered by Crossrail 2, including the release of passenger capacity and train paths into London. This is likely to support development growth in Surrey and Hampshire, including Woking and Basingstoke. With more than sixty potential stations on the Crossrail 2 route there is opportunity for commercial as well as residential development at and around stations. Significant private sector contributions towards station development may be possible. This is particularly the case in London, where the Commission highlighted examples of significant private sector investment associated with Crossrail Elizabeth Line stations including Canary Wharf and Woolwich. To date twelve major property developments are being integrated over or around Elizabeth Line stations. How will housing growth be delivered? The Commission reports that a co-ordinated approach will be required between planning and transport authorities within and outside London, with regional and local policy aligned to support the strategic ambition of Crossrail 2 in terms of unlocking housing growth. Neither the London Plan, nor any one local planning authority covers the entire Crossrail 2 route. Historically, outer London has been more resistant to higher densities of residential development, and some local authorities bordering the capital have been similarly resistant to accommodating housing growth which would effectively serve London needs. The Commission calls for strong measures to maximise the amount of new housing enabled by Crossrail 2, including a recommendation that new planning guidance could be considered for the whole route. Planning measures identified include the release of strategic industrial land, increases in housing density beyond that currently prescribed by planning policy, and where justification exists – through the review of Metropolitan Open Land or Green Belt boundaries. The Commission believes that without such measures there is little likelihood of the 200,000 new homes being delivered. Elements of these planning measures already exist with the release of industrial land already referenced in the London Plan. In addition, development in the capital regularly exceeds the density ranges contained in the London Plan. Metropolitan Open Land and Green Belt will arguably be among the most contentious development issues going forward, given the protection they are currently afforded by the London Plan and National Planning Policy respectively. The Commission calls for Crossrail 2 to be at the ‘heart’ of a new London Plan, and for a co-ordinated planning framework to address development decisions; from Government via a Crossrail 2 Act, and from relevant planning authorities via joint or complimentary plan making. The Crossrail 2 Growth Commission is currently working with planning authorities within and outside London, and is due to report in the summer of 2016. The link between connectivity and development density is well established in planning terms. Good transport links are pivotal in terms of enabling denser development, making locations more desirable, increasing land values, and ultimately creating viable development opportunities. However, established connectivity and development density relationships will need to be examined if the required housing growth is to be realised. So what could this mean for development opportunities around Crossrail 2? It is common for the connectivity and character of a location to be assessed together to determine an appropriate density range for development. Within London, the connectivity component is based on Public Transport Access Levels for a site, more commonly referred to as the PTAL. Despite well documented limitations of the PTAL methodology, it serves as an established and comparable measure of access to public transport services. With the TfL planning database now forecasting PTAL up to 2031, it is likely to be London’s connectivity reference for the foreseeable future. It is very likely that a new London Plan will feature revised connectivity-density matrices that promote the delivery of increased residential development within the capital. Outside London there could be an argument for assessing the development potential of sites in a manner that challenges established connectivity and density relationships. 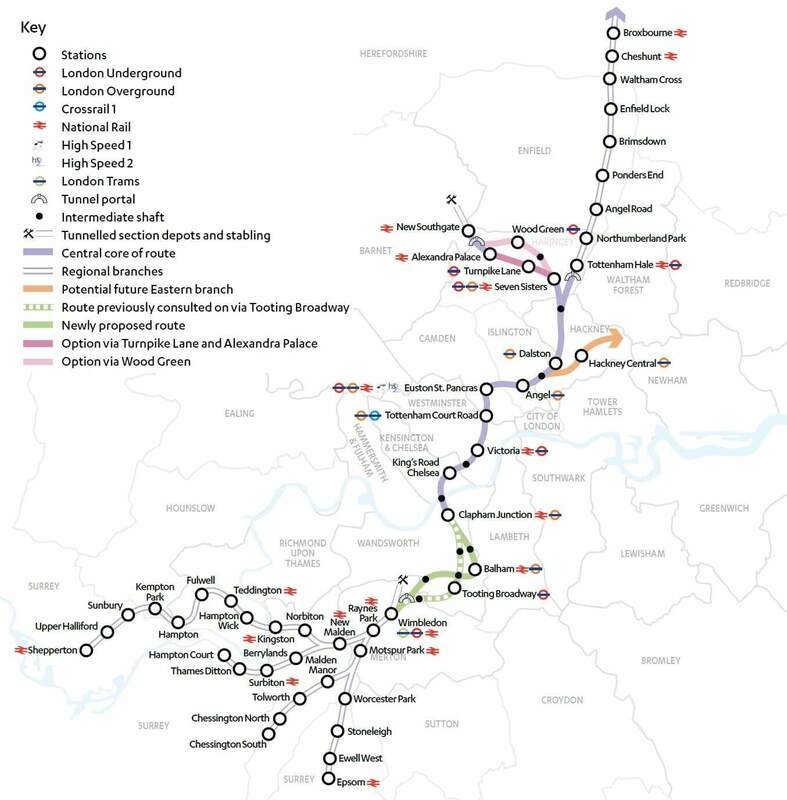 Such an approach could define an expanded zone of influence for Crossrail 2, maximising the extents of acceptable connectivity, and allowing higher densities of development to come forward on a broader geographic basis around the route. Revised connectivity parameters may recognise longer acceptable walk and cycle distances to stations, alongside revisions to local public transport networks to better integrate hinterlands with Crossrail 2 services. Planning obligations will be required which ensure targets and measures for sustainable travel are identified and delivered for areas where denser development is released on the basis of ‘stretched’ connectivity to Crossrail 2 services. The current indicative programme does not envisage Crossrail 2 being operational before 2033. In the meantime planning authorities continue with their Plan making processes. In London, Opportunity Areas and Intensification Areas will be prominent in the next iteration of the London Plan. Outside the capital planning authorities continue to undertake the strategic studies required to update their Local Plans. From existing sites and previously developed land, through to green-field locations, a full understanding of transport possibilities and opportunities will continue to be a key aspect of development planning. Ahead of Crossrail 2 a step-change in the relationship between connectivity and development density may be required to ensure the required housing growth is ultimately realised. Returning to the question of whether Crossrail 2 will benefit development in terms of how connectivity and density relationships are assessed in future? It certainly appears there is potential for such an outcome, particularly so given the Commission’s stated position that without such measures there is little likelihood of the 200,000 new homes being delivered.